Nail fungus can affect nails of the older population and also nails of younger people. With an appropriate care and treatment nail fungus can be successfully eliminated. From 2014 onwards we treat affected nail also with a new efficient method – 3TO Brace and Photodynamic nail therapy. Medical pedicure is the solution for foot problems! We use surgically sterile tools, state of the art equipment for foot treatment and professionally trained staff. CENTRE PEDIMED. EVERYTHING FOR FOOT CARE IN ONE PLACE. For our clients we offer high quality service of foot care (pedicure, treatment of ingrown toenails, treatment of nail fungus etc.) and with top equipment and professionally trained staff we raise our own expertise. In case of problems due to ingrown toenails, nail fungus, corns or other foot issues we are available on the phone from 9.00am till 8.00pm. You can also entrust us with your problems through our on-line booking form. Please fill in thoroughly all the information and we will contact you. counselling about problematic feet issues. We offer free counselling and feet examination for children. Book an appointment Quick order form for booking an appointment for examination. Explain your issues and we will help you. On Vizita.si we were talking about eliminating issues with ingrown toenails and nail fungus. Also Barbra Drnač openly talked about her difficulties. Centre PEDIMED offers Free counselling and examination of feet for children. 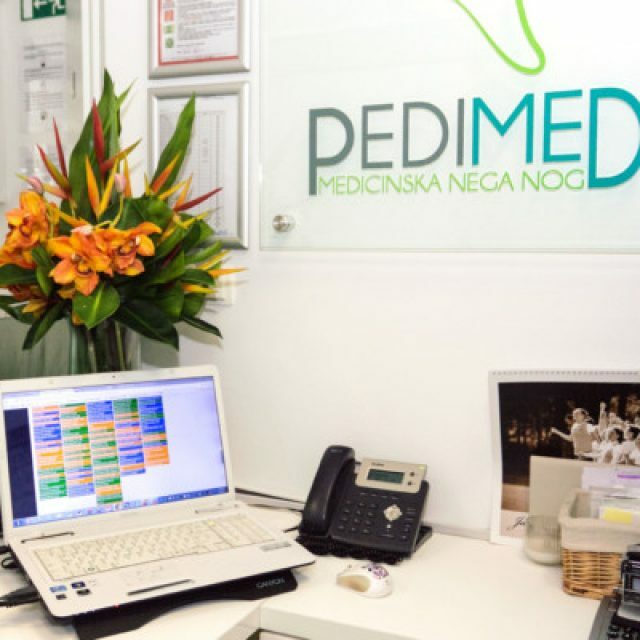 Centre Pedimed is a team of experts who take great interest in foot care. We are continually trained in Slovenia and abroad by recognized podiatrists (chiropodists). Unfortunately there are too many foot problems so our motto is: only the best is good enough. In this manner we want TO OFFER YOU the latest professional service in foot care. Karmen Perko is the head of PEDIMED Centre and a pedicurist, a beautician, a trainer and a specialist in the field of problematic feet, ingrown nails and nail prosthetics. We offer our clients high quality up-to-date expertly services in the field of foot care. I find foot care interesting and enthusing. I believe only the best is good enough for people with feet issues. Working with people with feet issues delight us. We love helping people with feet and nails issues. We monitor the patient and his progress individually from beginning till the end. For each service or treatment we keep a record in writing and in picture. Dr. Branko Pirš, board certified dermatologist and phlebologist. Hard skin is removed by a special machine and performed without soaking of the feet. Complete medical care of the feet. We eliminate many problems. Cooperations: physiatrists, diabetologists, dermatologists, physiotherapists.